Electromyography (EMG) - Analyzes muscle activity and reflex action: frequency and regularity of blinking are recognized. On the basis of the data received, the system analyzes a user?s fatigue degree. 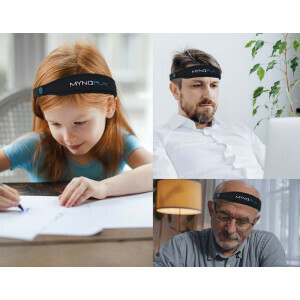 When it reaches the critical point and a person is at the edge of falling asleep, the service module of the cap emits an audio alarm and the wristband starts to vibrate. On the basis of the data received, the system analyzes a user`s fatigue degree. 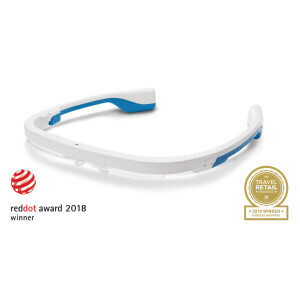 When it reaches the critical point and a person is at the edge of falling asleep, the service module of the cap emits an audio alarm and the wristband starts to vibrate. The system will warn you when it`s time to stop and have a break. If the alert is activated too often (once in 10 minutes), it`s advisable to give your body a rest. You don`t have to customize the device yourself, all you need to do is to put on the cap and the wristband and start them by pressing 2 buttons. Then, the system will synchronize on its own and start receiving brain and EMG activity signals. The cap and the wristband operate on integral accumulators, which help to save on batteries. It takes only 1 hour for the accumulators to charge, after that they operate for 6-7 hours non-stop. Put on the system elements.The sensor should fit tightly to your forehead, prevent your hair from falling upon it. Use a belt to adjust the closeness of contact between the sensor and the forehead. Fix the clip of the system block on your earlobe and wear the bracelet on your wrist. Turn on the device. Press the touch button of the service module and then press the power button bracelet. After that, a blue indicator on the system block begins to blinking - synchronization with the cap has started. After it is completed, the indicator will stop blinking and willconstantly glowing blue. Wait a couple of seconds. During this time, the cap indicator will start blinking red, green and blue. It means that the system is waiting for brain and muscle activity signals. As soon as waves of brain activity begin to be read out you will hear the sound notification and the bulb of the indicator will burn with blue. Everything is ready to analyze your state. Unique and innovative product for fighting with the monotony.